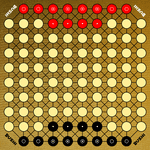 Bushi board and pieces in starting positions, Game Crafter 2014 edition. Bushi board, Game Crafter 2014 edition. Bushi, Nathan's 1977 "Shing Shang" edition, closeup of red pieces in starting positions. 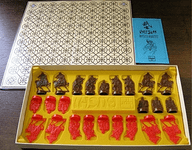 Bushi, Nathan's 1977 "Shing Shang" edition, side of box including copyright date and publisher information. 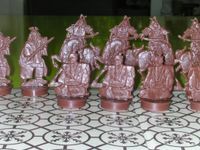 Bushi, Nathan's 1977 "Shing Shang" edition, pieces resting inside box. Bushi, Nathan's 1977 "Shing Shang" edition, top of box. Bushi, Nathan's 1977 "Shing Shang" edition, underneath the box's lid. 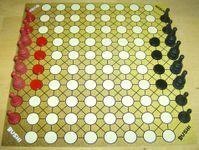 Bushi, Nathan's 1977 "Shing Shang" edition, game board and pieces in starting positions. 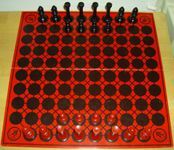 Bushi, Nathan's 1977 "Shing Shang" edition, closeup of black pieces in starting positions.